Illinois medical marijuana dispensaries made over $801,000 in medical cannabis sales since last November. According to the Associated Press, the retail price of medical cannabis is about $14 to $15 per gram. In addition, Illinois earned approximately $57,000 in taxes from medical marijuana. The state has 16 licensed dispensaries, but only 8 are actively taking patients. Thus far about 3,600 patients have been approved for treatment for the program. There should be an influx of patients and profits as more dispensaries open. Joseph Wright, dispensaries director expects 20 to 25 dispensaries to be open by the end of the year. 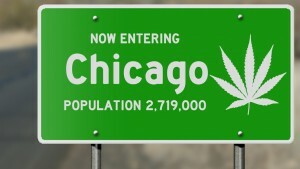 Illinois is one of a few states that have legalized medical marijuana. Advocates of medical marijuana hope the success in Illinois persuades other states to adopt the same policies. Many states that want to legalize recreational or medical marijuana face severe opposition. Proponents believe that allowing medical marijuana will not only help patients, but create an additional channel of revenue for the state. As seen in Illinois, proponents of medical marijuana hope to make a considerable amount of income from the sale and taxing of medical marijuana. In addition, supporters think legalization will save states money on law enforcement, legal fees, prison sentences, and other judicial costs. Of course, the potential revenue generated from medical marijuana will differ based on state policies. Even if states were to legalize the sale of medical marijuana, dispensaries and growers will have to surpass a few hurtles. One major issue is finding banks willing to handle medical and recreational merchant accounts. Under current guidelines, bank officials must submit annual reports validating the legitimacy of any cannabis accounts. If there are any irregularities found with the cannabis accounts, banks can be charged with major penalties. Still, medical and recreational merchants have found success when dealing with smaller, more progressive banks. Medical marijuana and recreational payment processing is a complex business that requires expert knowledge. As states begin to legalize and decriminalize marijuana, you will need a competent lender that specializes in marijuana business funding to infuse your business with cash. This entry was posted in illinois Marijuana and tagged Illinois Medical Marijuana, Marijuana Business Funding, Medical Marijuana by admin. Bookmark the permalink.